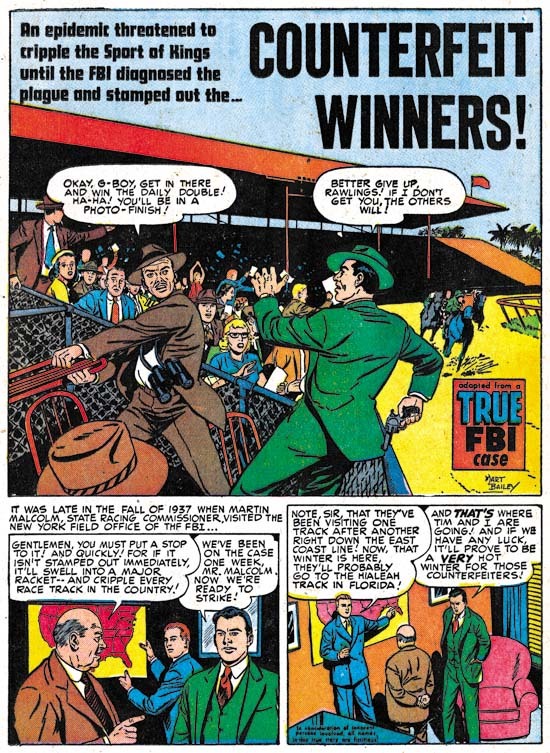 At this point both titles were cancelled, victims of the glut of new comic book titles that appeared now that wartime paper restrictions were lifted. 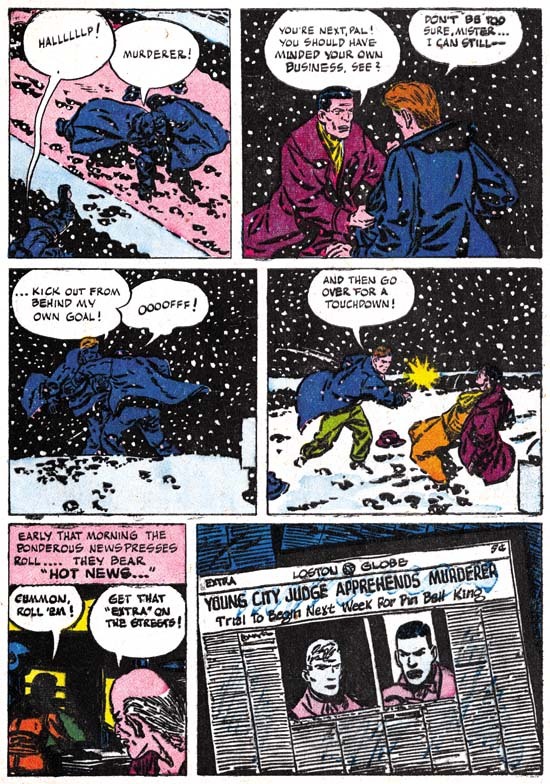 However Harvey sent to subscribers small issues of Stuntman and Boy Explorers. 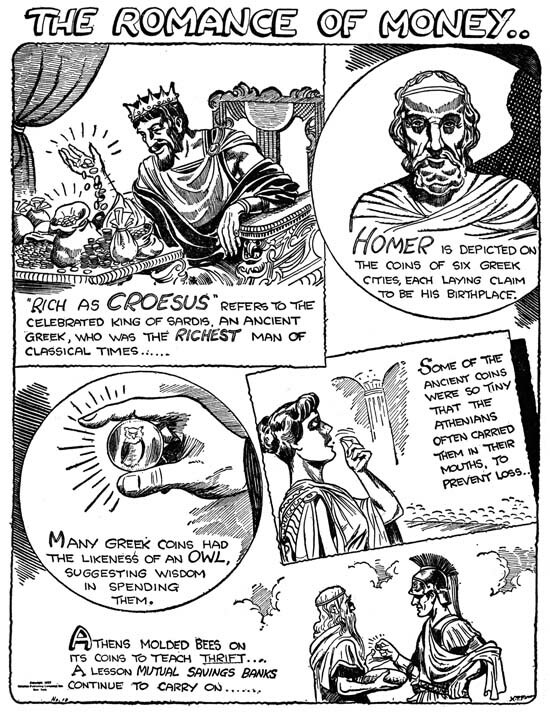 These were small not only in size but also in content (only two stories) and without color printing. 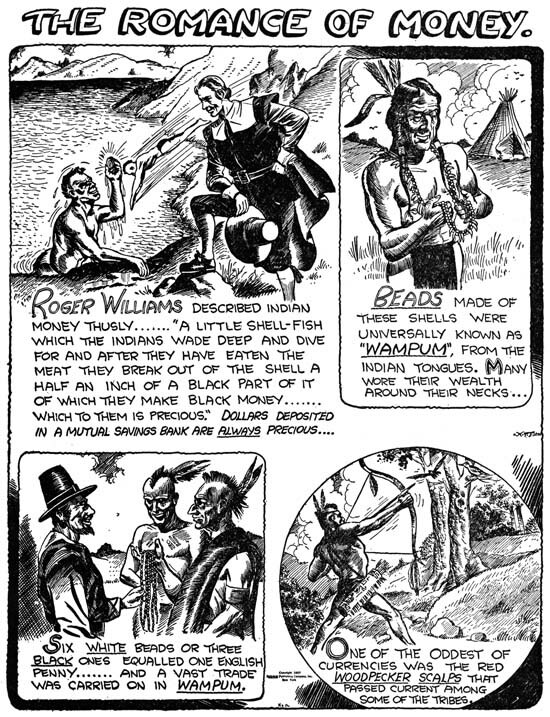 However original art in Joe Simon’s collection indicates that a Vagabond Prince story (“Trapped in Wax”, Simon) was also originally meant to be included in Boy Explorers #2. This origin story would never be published. The more observant reader may have noticed two anomalies in the list of inventoried stories published elsewhere by Harvey. While most features had only one or two stories there were 4 for the Demon and 7 for Danny Dixon Cadet (the subject of a future post). The Demon was also unusual in that it had never previously appeared in either Stuntman or Boy Explorers. 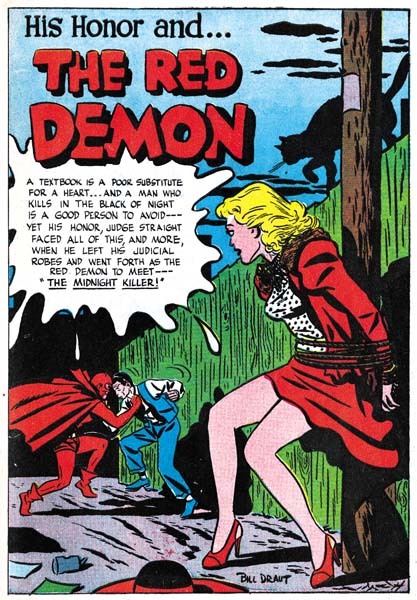 My original reaction when I was reviewing this was that perhaps The Demon really was not a Simon and Kirby production but something that Bill Draut pitched to Harvey after the two titles were cancelled. However on further thought I considered this unlikely because the origin story was the third Demon story that Harvey published. 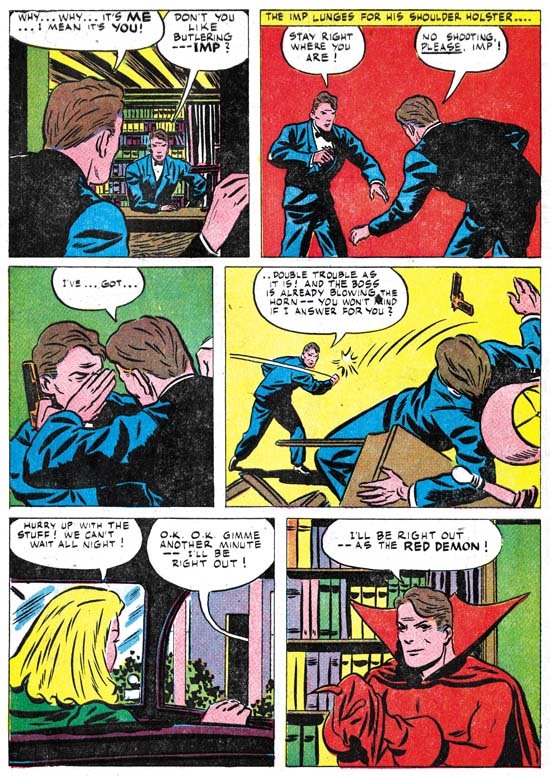 This sort of error would have been unlikely to happen if The Demon was new feature but just the sort of thing to be expected if the Demon was just inventoried material. I think a better explanation for the Demon anomaly would be that a third title was originally proposed. Work may have already progressed when Harvey decided to test the waters with just two titles. 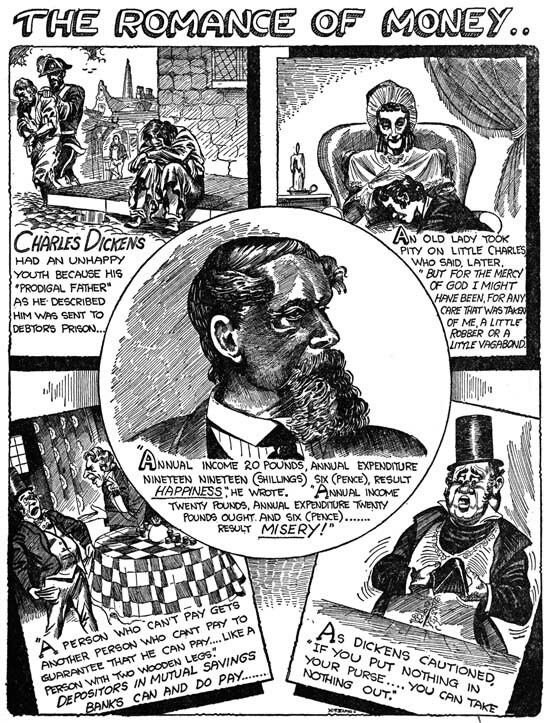 If there was to be a third comic book it was most likely that the Duke of Broadway would have been the title feature. 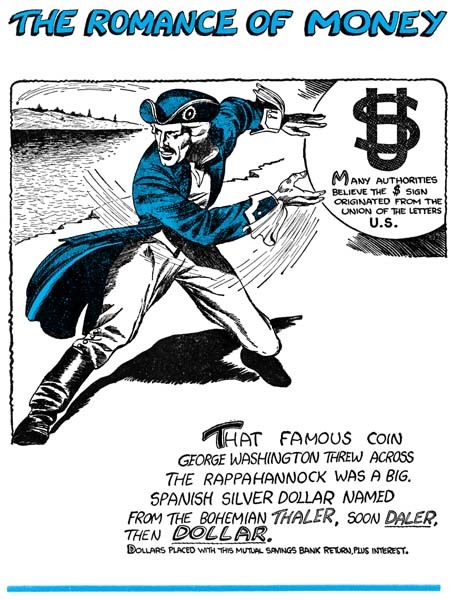 The Duke’s appearance in the other two titles would have been a means of generating interest. Bill Draut’s Demon would have been a backup feature. 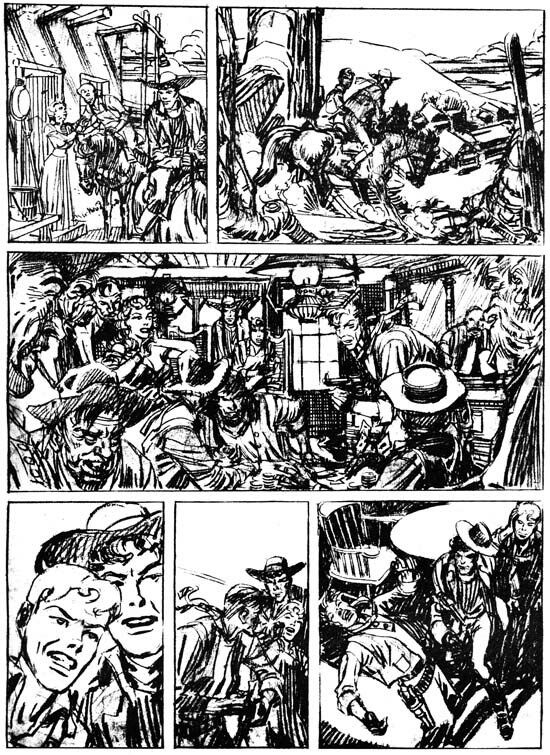 Draut’s art for the Demon, the Furnished Room and Calamity Jane along with Stony Craig was already very distinctive. 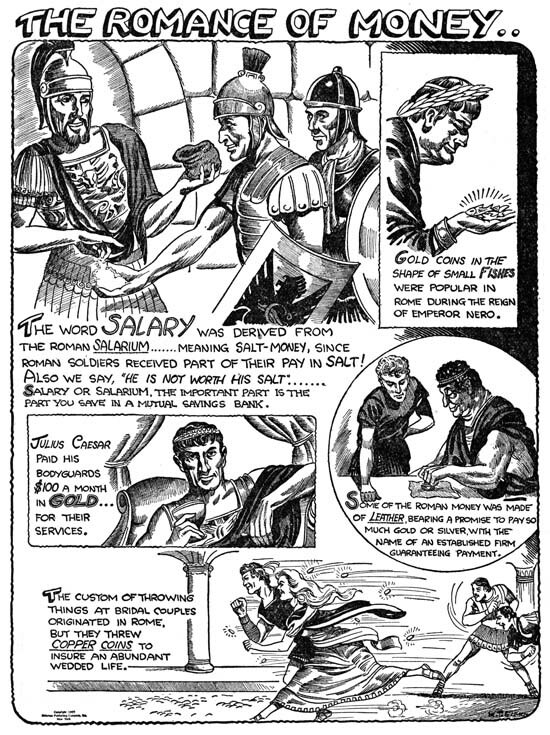 Not that all the characteristics of his later work for Simon and Kirby were present but there is enough that it is easy to recognize his hand. 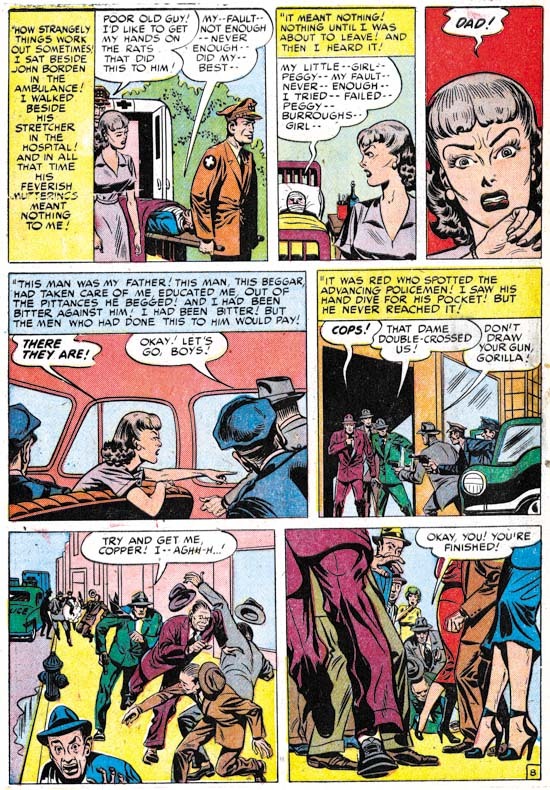 I had previously considered Jack Kirby a big influence on Bill but the Stony Craig art clearly shows that is not strictly true. 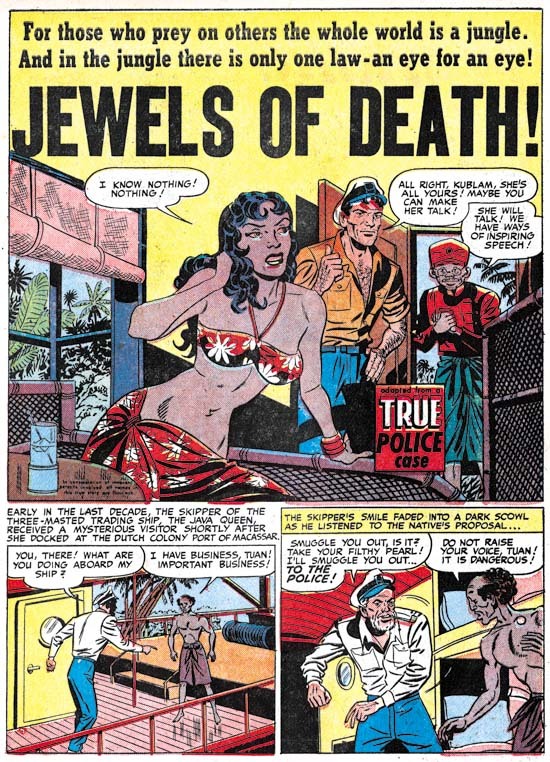 Many of the similarities between Draut and Kirby are the due to their common interest in Milton Caniff’s art. As I mentioned above, the origin story for the Demon was not the first one printed. This can be clearly seen from page 7 of “The Midnight Killer”. Here the judge posing as a bank thief on the run finds the costume worn at a party by the murdered victim. This device would make no sense unless it was the origin story. 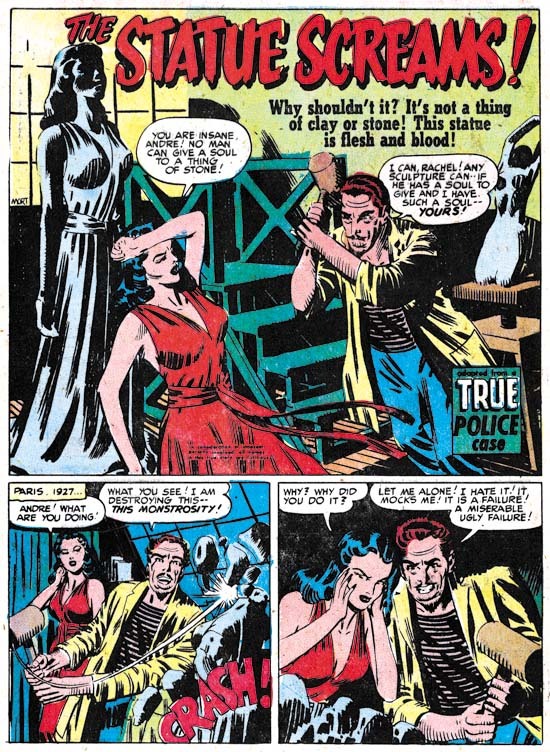 Because so much of the work Bill Draut produced for Simon and Kirby would be for romance titles there is not much depiction of action in most of his art. 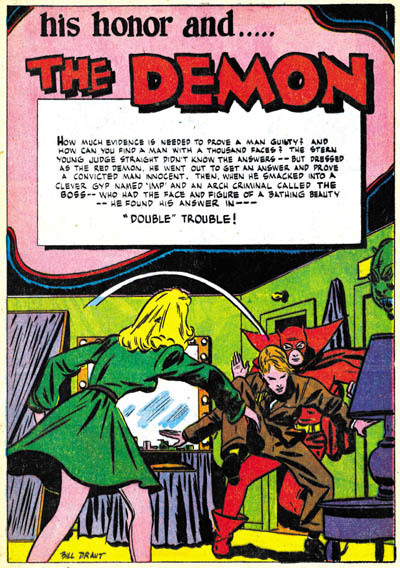 However action plays an important part of the early work by Draut particularly in the Demon. Frankly in some cases Bill is not very effective in drawing fight scenes. In the splash for “Double Trouble” it is clear that the woman has thrown the man into the Demon. But how did she accomplish this feat, was is some sort of Judo trick or was she stronger then she looks? How was the man standing before the throw that could explain his final position? Draut’s splash is just not very convincing. But it would be a mistake to conclude that Draut simply could not handle action scenes. 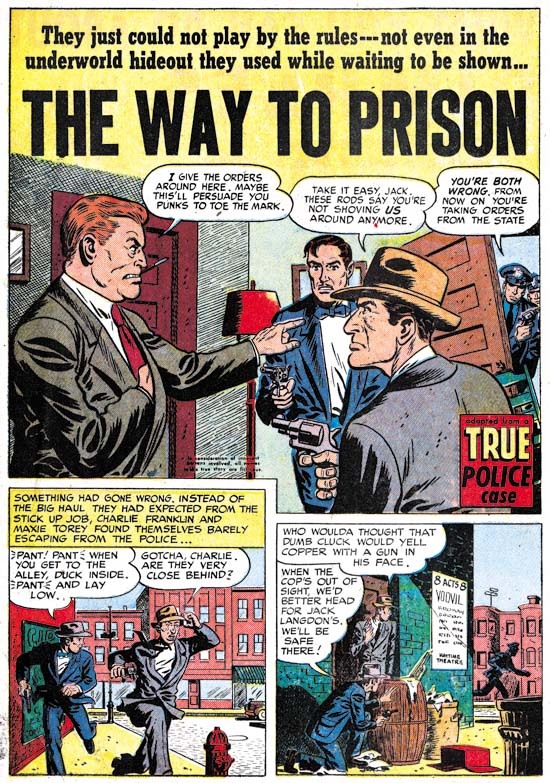 The page shown above from “Too Cold for Crime” is a great example. While the layout is not done the way Jack Kirby would have handled it, it still is very dynamic page. The high angled view used in the first panel along with having the fight occur during a snow storm both are very graphically interesting. 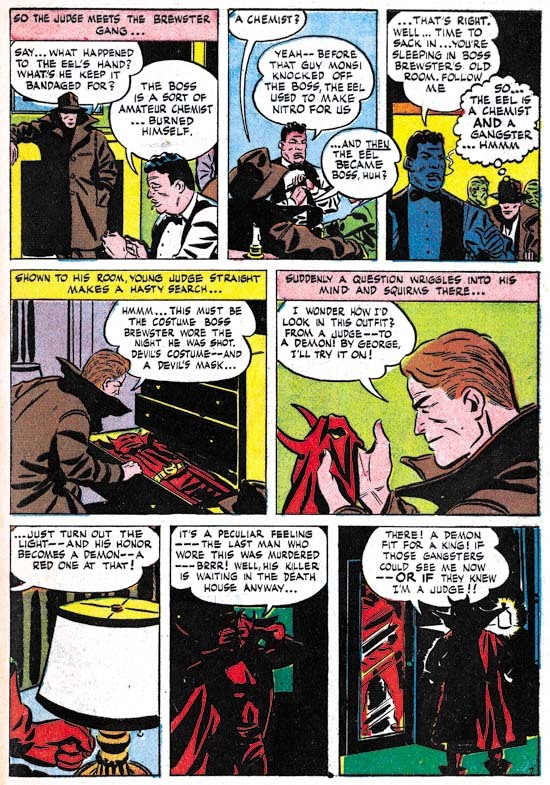 Unfortunately the page is marred somewhat by the colorist use of blue for both figures in the first and third panels. 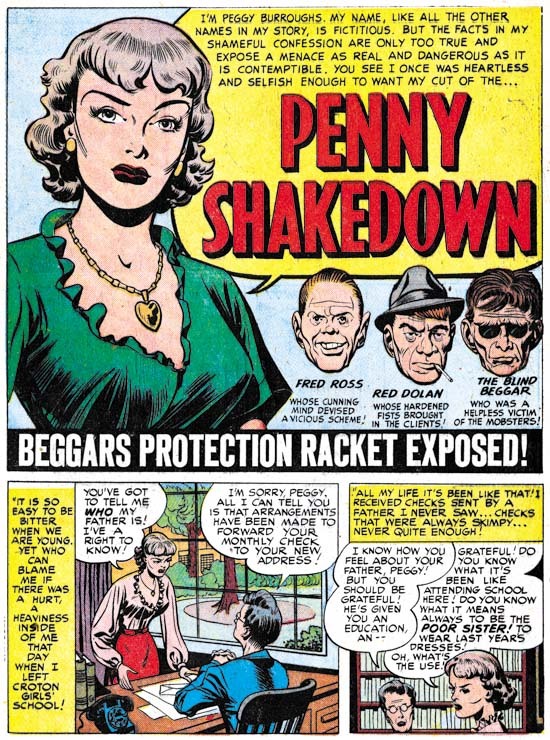 Although I now credit Milton Caniff with jointly influencing Bill Draut and Jack Kirby (among many other comic book artists) there are still aspects of Bill’s art in the Demon that suggests that he had lately studied Kirby’s art. 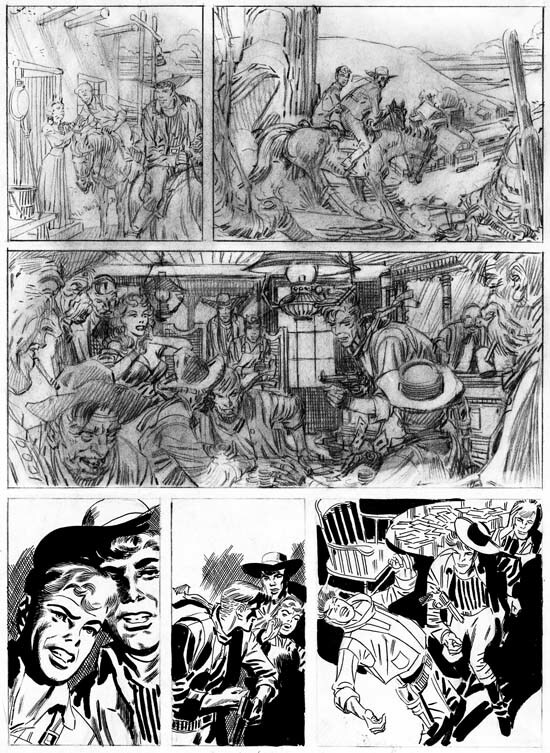 The use of exaggerated perspective when depicting a fist fight is not something associated with Caniff, but it is a classic technique for Kirby. While I do not think Jack would have made the slugger in panel 4 so relatively small, the perspective of the sluggee does remind one of Kirby’s art. I will close with another action sequences. This page opens with the Demon battling his opponent only to end with the hero turning to the villain for help. 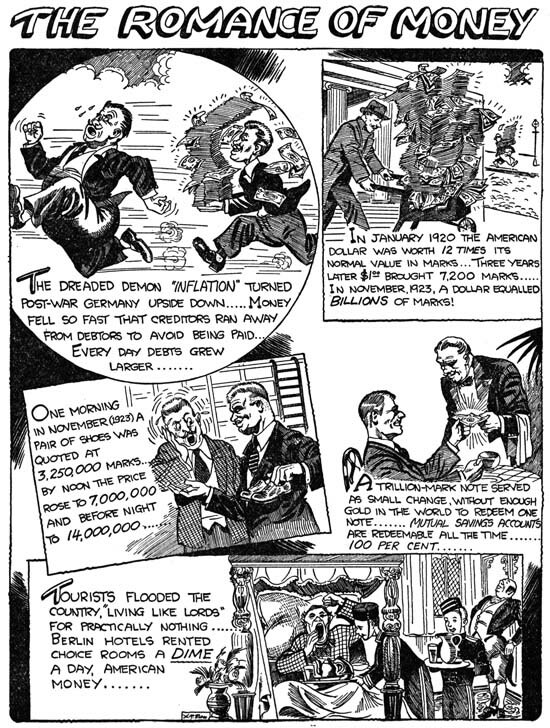 Of course an unknown writer should likely be credited for this plot but Draut does a great job of graphically presenting the story. 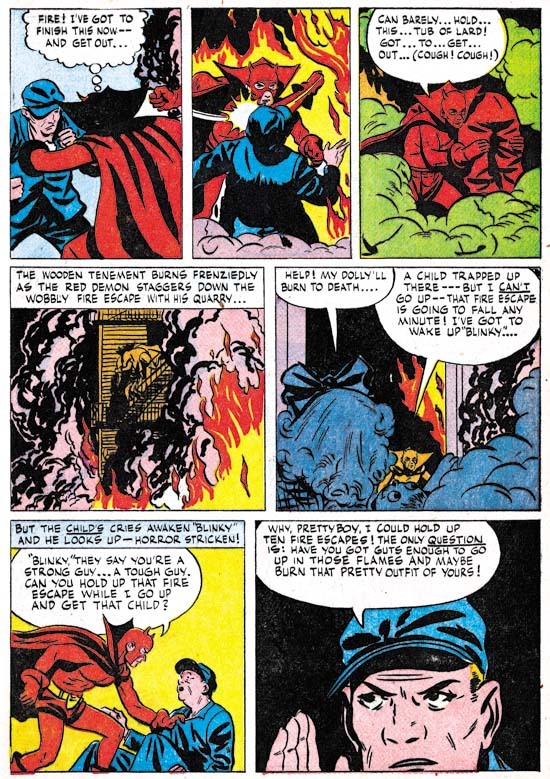 I love the way the smoke is introduced in one corner of the first panel and how the fire progressively takes over more and more of the panel until the fourth one where the Demon carrying his defeated foe is almost lost in all the smoke and flames.